By now we all know how things ended in The Amazing Spider-Man #700, with Otto Octavius transferring his… soul into Peter’s body and then killing him. Now he runs around as the Superior Spider-Man. So what this new mini-series does is that it goes back to the days of Peter Parker as the friendly neighbourhood wall-crawler and gives a very introspective look into his character. If I had to sum up the story, I’d say that its a story where one man with a certain power has to fight himself on one level and nature on another level. There’s a mother-of-storms coming to New York and in the lead-up to the storm hitting, Peter has to endure another soul-grinding day on patrol, suffering through J. Jonah Jameson’s tirades, and so on. Writer David Morrell tells a concise and focused story as he deals with Peter’s feelings and his ruminations about the great responsibility that he’s taken over himself. Reading through the early pages, its almost as if Peter is getting tired of doing the same thing over and over with nothing to break the monotony. The usual thieves and muggers, the usual drunken speedsters, the usual insults, the usual moments of feeling down about himself. With very few words, Morrell gets you to really care about the character. There are no big moments here, any splash pages where things awe you with the scope of it all. No. This is a story of human interest, of how tired one man gets when he has so much to do on a daily basis, juggle three different parts of his life, with one always overshadowing the others to great effect. 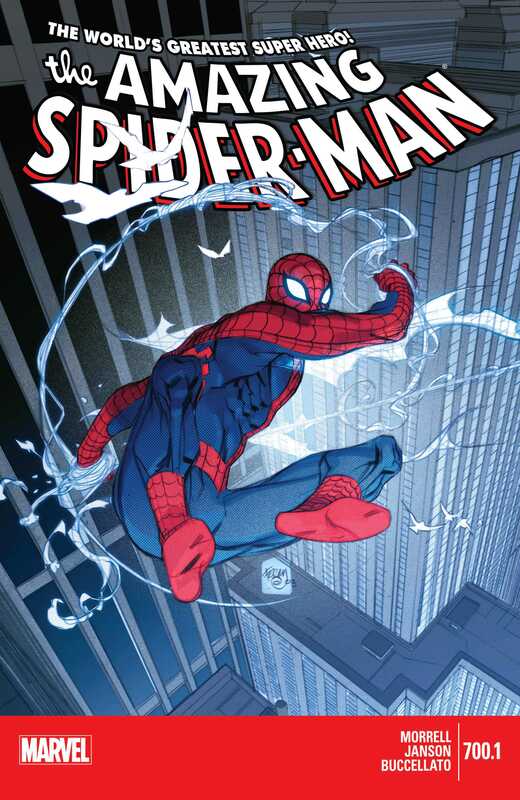 Having read the first volume of Slott’s new series and this issue, now I really want to move through The Amazing Spider-Man. While I don’t have a particular attachment to Peter like I do for, say, Batman or Aquaman, he is someone that I really like. And Morrell gives a great view of the character through a story like this. By avoiding all the flashy stuff, Morrell really gets down to the barebones of the character and the dialogue for all the characters involved in this issue, such as Aunt May and Jameson are pretty much spot-on. Some really heart-warming scenes with Aunt May in the issue, and I really enjoyed those. The art in this issue is by penciller Klaus Janson and colourist Steve Buccellato, both of whom do a pretty fantastic job. Like the script itself, Janson’s pencils are clean and simple without any flashes. He draws everything rather cinematically but he never overdoes any of it and he keeps the story moving along at a really good pace, which is vital for a story like this. And all his characters feel lively in the panels, instead of being all stiff and boring throughout. Definitely not fun, that. Also, I really liked Janson’s Peter Parker, who is subtly different than how he is in the rest of the series. Buccellato’s colours complement Janson’s pencils quite well and his work makes the art really pop off the page and shine. If it wasn’t for his work and the often-bright colour palette that he uses, a significant portion of this issue would have been rather dreary. But that’s not the case, and for that I’m glad. I’d say that this series is off to a fairly good start. The particular numbering doesn’t make sense, given the events that happened in The Amazing Spider-Man #700, but I’d say that’s the only real criticism of this issue that I can offer, aside from the enjoyment factor. Looking forward to the next issue. More The Amazing Spider-Man: #648-651. Posted on December 7, 2013, in Comics Reviews, Review Central and tagged Comics, Comics Review, David Morrell, Klaus Janson, Marvel, Marvel Comics, Morry Hollowell, Mutants, Pasqual Ferry, Peter Parker, Review, Review Central, Spider-Man, Steve Buccellatto, Superheroes, The Amazing Spider-Man, VC's Joe Caramagna, VC's Joe Sabino. Bookmark the permalink. 6 Comments.